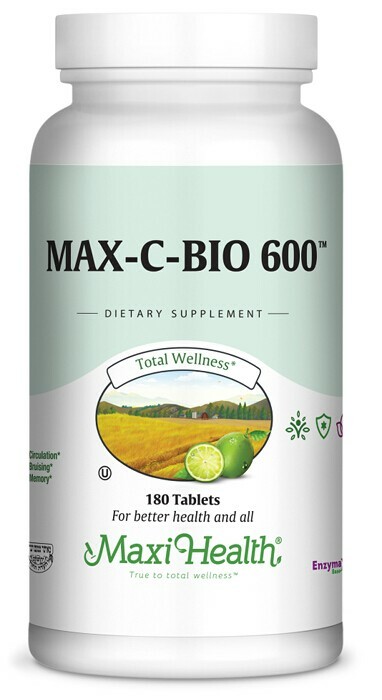 Max C Bio 600™ was formulated to give you the health benefits of vitamin C combined with bioflavonoids, turmeric, and gingko biloba. Turmeric contains the active ingredient curcumin which contributes anti inflammation and antioxidant support. Ginkgo biloba in combination with bioflavonoids supports a healthy circulatory system and neurologic health. This unique combination gives you even more antioxidant support. Try Max C Bio 600™ today! Take one (1) tablet once or twice daily, or as directed. Other Ingredients: Microcrystalline cellulose, dicalcium phosphate, vegetable stearic acid, croscarmellose sodium, vegetable magnesium stearate, Enzymax® (calcium carbonate, bromelain, papain, lipase, amylase, protease, silica). aquesous film coating (purified water, cellulose, chlorphyll, vegetable glycerin). This prodcut contains no animal products, soy, wheat, gluten, salt, sugar, milk, yeast, artifical flavors, colorings or preservatives.